Newly elected Board of Finance member Sheri Gordon, left, her husband Paul, son Max, 11, daughter Chloe, 7, and nanny Marine Martin. There was no debate over the fun and pride of Monday night’s oath of office ceremonies for this year’s newly elected officials. Most of the 51 officials who will serve Westport on the Representative Town Meeting and five other boards and commissions were present to be sworn in by First Selectman Jim Marpe. Family members were on hand — and sometimes on stage — to share in the moment of the 2015 inauguration. 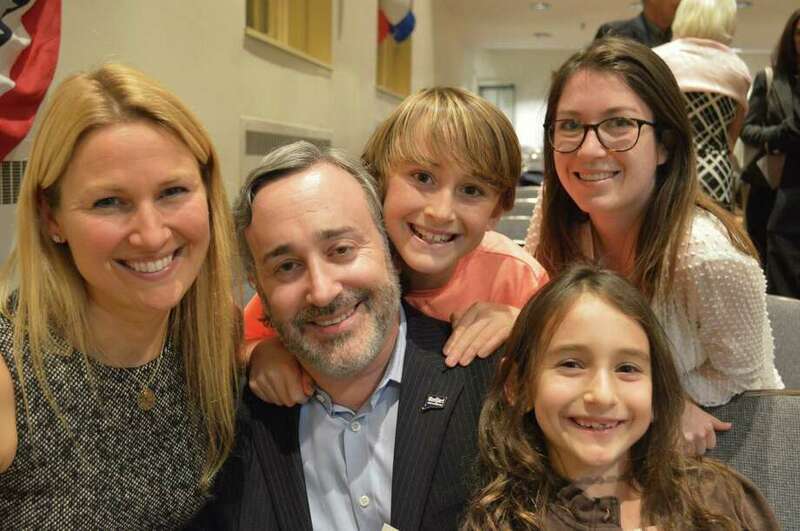 “This is a significant moment for all of you who worked hard to be elected to public office in Westport, and you and your families should be proud,” Marpe said. Newly elected — or re-elected — members of the Boards of Finance, Education, Assessment Appeals, and Zoning Appeals were each sworn in in turn, as were Planning and Zoning Commission members. Each of the nine districts of the RTM then followed in turn. “Thirty-seven of those (51 elected officials) are returning to the same office for an additional term,” said Town Clerk Patricia Strauss, with nine others serving for the first time in public office, three incumbents moving over to a different post, and two RTM members returning after a sabbatical. “Administratively, this year’s election process unfolded with very few issues,” Strauss said, thanks in part to 125 election volunteers. She noted that Westport’s 38.7 percent turnout was slightly higher than the state’s average of 38.2 percent. Marpe made note of several “C’s” that were pivotal for strong service to the town, including “commitment, collaboration and communication,” as well as “civility” and a “citizen-centric” approach to governing. Following the inauguration, people visited with one another in the Town Hall lobby for refreshments and congratulations. Hope Feller, RTM District 6, commended Marpe for his inspiring words. Several people acknowledged they were glad how the elections had gone in some cases, both for themselves and their respective boards, including Board of Education Chairman Michael Gordon.